This is Vladimir Sausagiev-Bummerski Putin, president of Russia since 2000, leader of men, closet sleeper with men, tamer of wild beasts. Look at that pathetic animal on which he sits. Its spirit is broken. It bends to Putin's will and to the muscular weight atop it. This is a horse that knows struggle is futile. 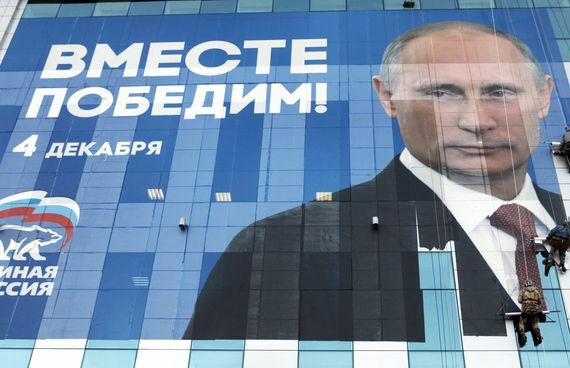 Should it rear up or kick out against its master it knows it will feel the full force of Russia's security apparatus - the leader of which is Vladimir Putin - after feeling the full force of a disgruntled Vladimir Putin. KGB FSB agents are trained to kill a horse with two fingers. Vladimir Putin can kill it with one. This clifftop is very high. 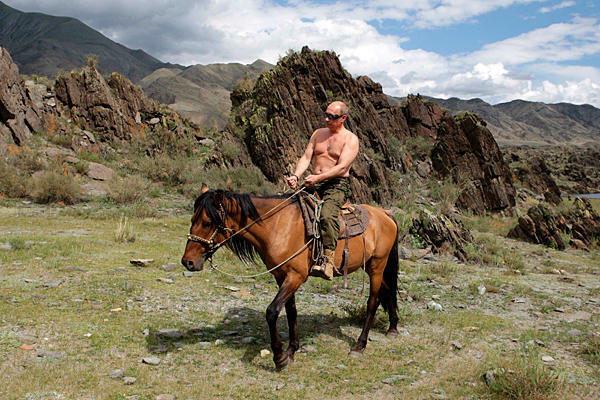 This is Vladimir Putin, saviour of the Russian economy, protector of the people, owner of a range of natty suits. 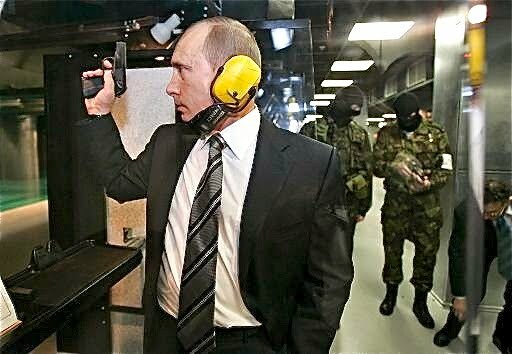 On this occasion he is promoting Russia's world-leading handgun industry. When Putin came to power, Russia's firearm industry was on its knees, the international consumer looking down on it piteously. Now, positions are reversed. Except Russians feel no pity. Russia is proud. Oil, natural gas, polonium, Russia exports it all. Russia is strong. Others are weak. Vladimir Putin is strong. Opposition is weak. 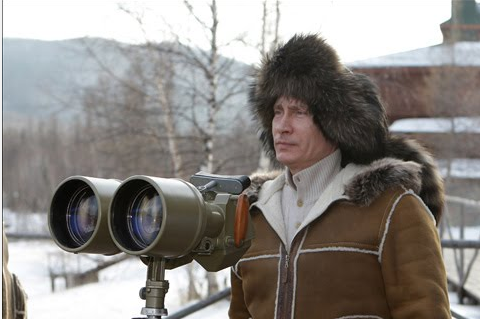 This is Vladimir Putin, explorer of the arctic, conqueror of lands, master of the bear. Observe how Putin stands over his prey. While others loiter around the hind quarters, Putin approaches the jaws of the beast. He pokes its nose with contempt. How dare it wander across his land? 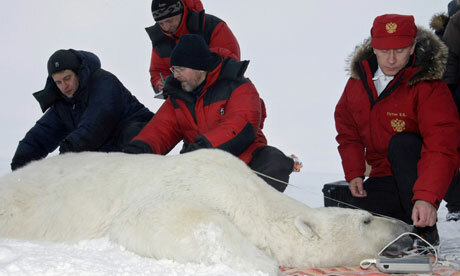 Since 2007, the North Pole has been Russian territory. Since 2008, South Ossetia has been his as well. This bear thinks he's big. Putin is bigger. Russia is bigger. This is Vladimir Putin, husband of his wife, father of his children, a man. He owns a sofa and an array of complementary casualwear blending nicely in with his surroundings, like the calculating judo master he is. You can only see him because he wants you to see him. He owns a medium of the range television, which screens programming of a standard that is uniformly satisfactory. He owns a dog, which he loves very much. It does as he commands and obediently sits next to him. He owns a lady from the census board, who dutifully takes his family details for public record. In all these ways he is very much like the average Russian. He is an everyman, the greatest everyman in Russia. This is Vladimir Putin's army. Women of intellect, ladies of resolve, washers of cars. When Vladimir Putin organises a political rally, his personal magnetism attracts perky blondes from all walks of life. He is not some worthless, ageing technocrat, hamstrung by asinine thoughts of rights and laws. No. He attracts the young. Look how happy they are in Putin's Russia. Their outlook is buoyant. Their beliefs firm. They wear sloganed tops in testament to Russia's future. It is a future of openness and transparency. This is Vladimir Putin, winner of elections, collector of votes, politician. He is an electoral force that cannot be halted. See how his tiny puny subjects plaster his image to this building. He is ten times the size of them. They are nothing. Putin is everything. There is no one else, not on the state funded television, not on the state regulated press, certainly not on this building. See how they desperately cling to his tie. They rely on him to stop themselves from falling to the Moscow streets below. Putin will not fall from the building. He is the building. This is Vladimir Putin, man of steel, man of rubber, man of Russia. He loves his country. He is its leader. His bike dominates the roads of his nation. He is too fast. His motorcade is too wide to get round. There is no overtaking. There is no corner of his great land the bike cannot reach. Those who don't love his country like him shall be ruthlessly crushed. 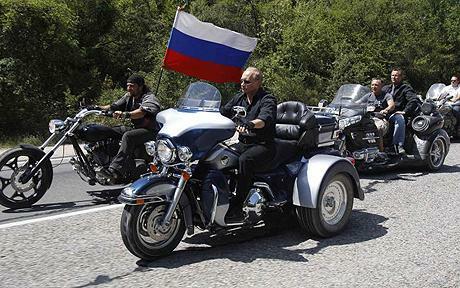 Whether it is the enemy within or on the outside, Putin will mount his Harley Davidson of patriotism and chase them down. This is Vladimir Putin. He is watching you. He is forever vigilant for his people. He cares. He cares about what they read in the papers, about what they write on the internet, about whether they congregate in groups of two or more. He maintains order. This pleases him greatly. See how he almost smiles. ↑ Any measures taken against the horse would follow a rigorous investigation leading up to a fair trial. ↑ Still. There is no divorce. ↑ Check the records. No divorce. This page was last edited on 8 August 2013, at 00:12.